I have previously posted a story about the McPherson County Courthouse, based on newspaper clippings. The third McPherson County Courthouse was destroyed by a tornado in 2003. The story posted in January of 2013 tells of the construction of the new courthouse. You can find that story HERE. The construction of the first McPherson County Courthouse is an interesting story. In 1890, shortly after the county was organized, two tenderfoot boys, Russ and Manley Calhoun, bareheaded and barefooted, walked up from North Platte. They arrive at the Whitewater Ranch, twenty-three miles northwest of Tryon. At the Whitewater Ranch they purchased four four-year-old wild steers, horns included. These steers had not had a rope on them since they were branded, and they never did like a rope, anyway. The boys, pitchforks in one hand, ropes in the other, proceeded to break the steers to lead. In a couple of days they could be led. They were named, appropriately, Thunder, Lightening, Fighter and Kicker. Instead of the usual yokes for oxen, the boys turned horse collars upside down and harness hames the same way. The pull of the trace-chains came from the top of the shoulder, similar to the usual yokes. After plowing sod all summer, in the fall they plowed sod and hauled it to the courthouse site. John Godfrey, who was quite an expert in laying sod walls, was hired for the job. The roof was hip style, with rafters and sheeting covered with tar-paper, overlaid with tough prairie sod. Adequate provision was made for the safe keeping of the records. A brick vault with a strong door was built in one corner. A steel safe was purchased and record books obtained and the officers were ready for business. 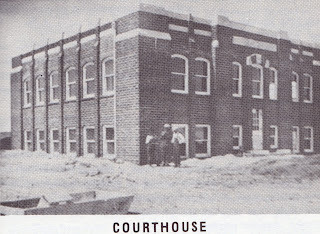 The courthouse grounds were enclosed with a barb wire fence to prevent roving livestock from entering the yard. If livestock rubbed the sod walls there was unnecessary wear. There was a well on the grounds where man and animals could obtain a refreshing drink. 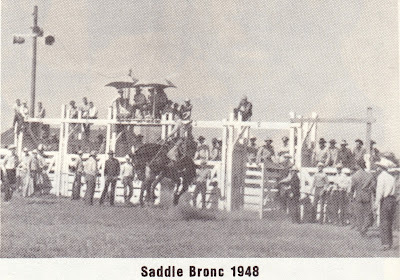 There was a turn stile gate and a hitching rail south of the fence, where farmers and ranchers would tie their teams and saddle horses. 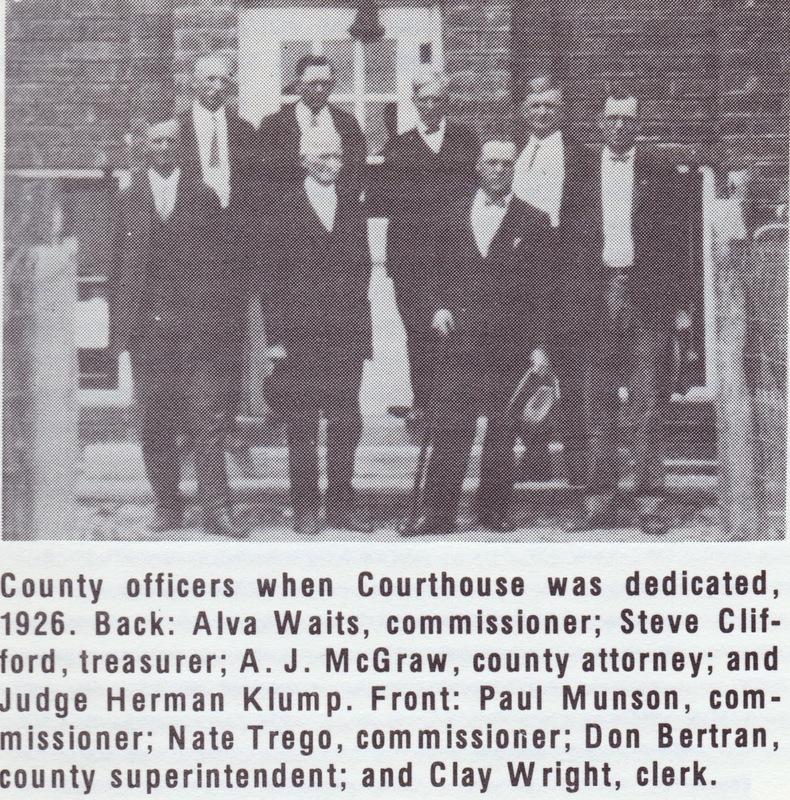 The County Clerk lived in a part of this sod courthouse. There was only one other building in Tryon at first. 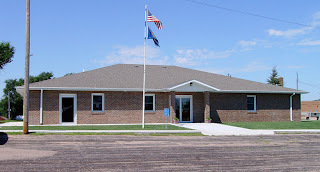 The courthouse was the social center of this little community and all meetings were held there. 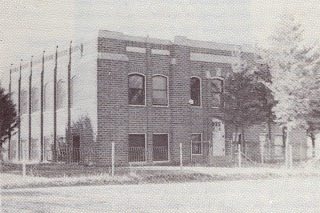 The courthouse was also used for religious services whenever a traveling minister or missionary was in the neighborhood. On many occasions homesteaders and cowboys gathered for old time dancing to the music of fiddles, harmonicas or whatever, playing the popular music of the “gay nineties”. These dances were usually held on a Friday night and lasted until daybreak. On Saturday they transacted their business. Sometimes weary travelers were permitted to spend the night in the comfortable old sod courthouse. The writer was one of these fortunate people. In later years the sod walls deteriorated until, as one person described it, “the roof was held up by the wallpaper”. At that time walls of frame construction were made outside the sod walls which were removed later, and the roof shingled. The furniture was rather crude, as there were but little funds for this purpose. In 1917 Mr. L.E. Pyzer was County Treasurer, and at his own expense, he had his son, Lisle, construct a nice new desk for his office, which was much more convenient than the desk which it replaced. Prior to this, in July 1912, a set of tool-proof jail cells were purchased from the Pauly Jail Co. of St. Louis, Missouri, at a cost of $1,300.00. These were placed in a small frame building costing $180.00. These purchases were bitterly opposed by the citizens of Arthur Precinct, at the western end of the county, who accused the official of graft. 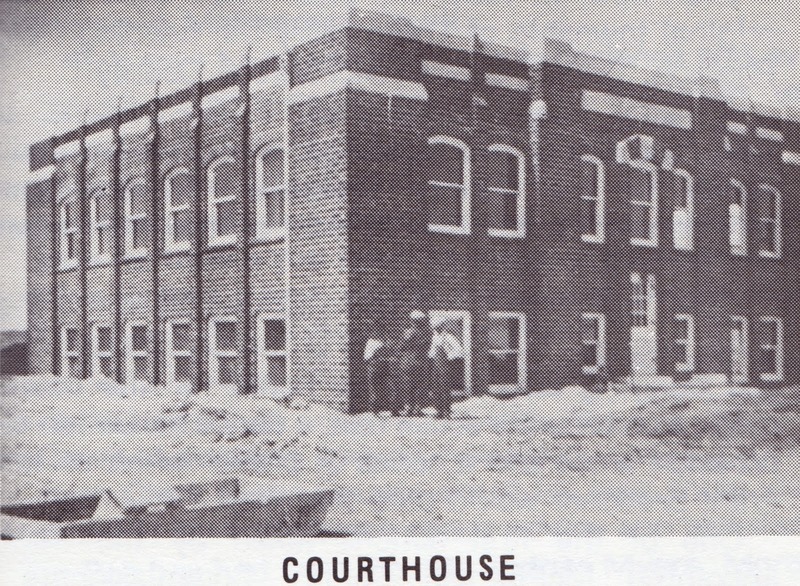 By 1916 McPherson County had outgrown the old courthouse, and a proposition to vote $4,000.00 in bonds for the purpose of building a new courthouse was submitted to the voters. 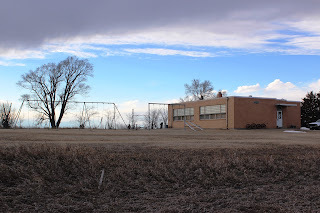 Although better facilities were badly needed, the bond issue was defeated by the voters. 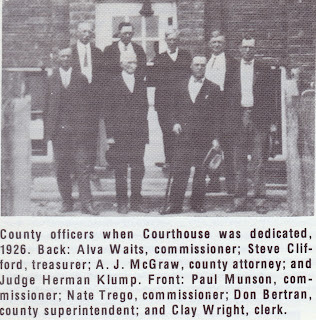 In 1920 a five mill special building levy for the purpose of a new courthouse was voted by the county board. Construction was started in 1925 and the building was occupied by county officials during the summer of 1926. The special levy proved insufficient and on January 21, 1926 a special election was held to approve a $6,000.00 bond issue, to complete the building, install a heating system and purchase furniture. These bonds carried. However, due to a technicality, this was found to be illegal. Another election was held and everything completed. Now, McPherson County has a modern up-to-date courthouse.